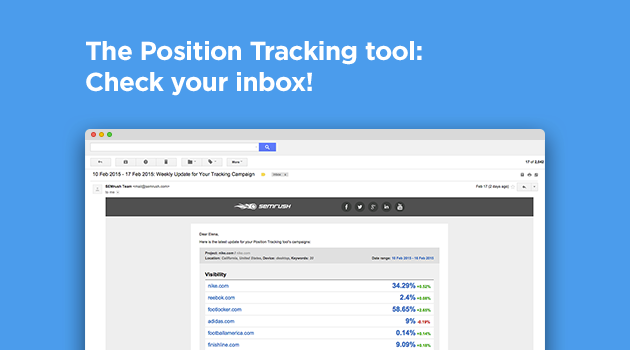 The Position Tracking tool: Check your inbox! The next time you open your weekly update email for your tracking campaign, you’ll find a surprise inside: a newly designed email template showing easy-to-understand keyword ranking data, your and competitors’ domains’ online visibility, the number of keywords in the Google top 3, 10, 20, and 100 per domain, changes in your site’s performance–everything you need at a glance! If you need more details on keywords’ ranking statistics, simply click on the clickable elements in the email to view the Position Tracking tool’s interface! The new Position Tracking tool: Take a tour! The SEMrush Keyword Research tool has just been refreshed and enhanced with PLA data. Try it out!